Scrap materials come together to create a miniature Christmas village display kids can help create in a diorama style. Food packages, small boxes or even graham crackers morph into assorted buildings for a holiday tabletop display. Small gift boxes, food cartons and other small, clean packaging serve as the structures for buildings. Cut boxes or cartons down to the desired sizes, then use scrap cardboard from thin boxes to build roofs and chimneys for the buildings. Spray paint all the buildings outdoors or in a well-ventilated area, or cover them with construction paper instead of using paint. Cut out windows and doors; use scrap construction paper to make window shutters and doors. Glue bits of colored tissue paper over white tissue paper to make a faux stained-glass window. 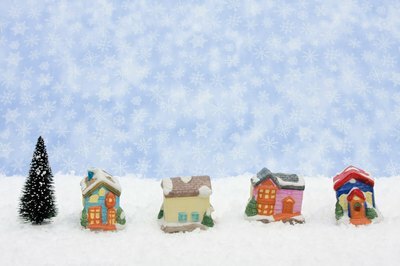 Use index cards or last season's Christmas cards to create a series of buildings. 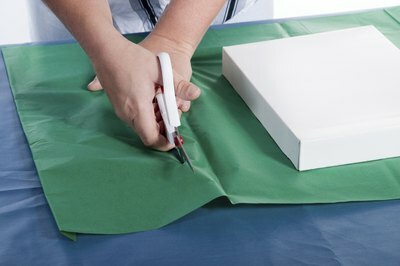 Cover the buildings with wrapping paper or colorful scrapbooking paper. Form snowmen from cotton balls pushed down over a rounded toothpick, or use white play clay for the snow bodies. 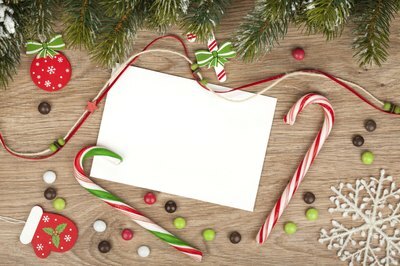 Wrapping paper rolled into a cone shape creates a Christmas tree for the village; choose green paper with ornaments or bows on it for a pre-decorated paper tree. Tape the cone over a short pencil or skewer as a tree trunk, using a ball of play clay or poster putty to hold the tree upright. 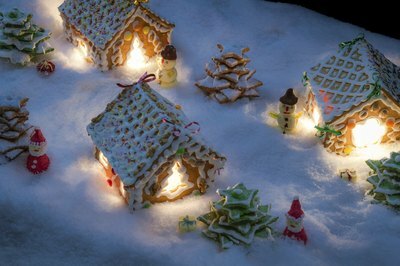 Create an entire tiny village out of food products instead of one large gingerbread house. Graham crackers or flat cookies can be used for the walls of each building; icing acts as glue to hold the structure together. To make a faster-hardening icing, mix 1/4 teaspoon cream of tartar into the can of icing; it will be edible once the icing hardens. Craft shrubs from gumdrops and attach gummy bears to sidewalks as residents of the edible village. Create trim for the roofs using candy-coated chocolates or candy discs. Snow sets the stage for a Christmas village, serving as appropriate ground cover no matter where you intend to display your creation. A roll of batting flattened over a smooth surface looks like a blanket of snow. Place wads of batting or cotton stuffing in designated areas underneath the snow blanket to create snow piles and hills.